A new Pokémon mapping website allows players to scan a specific location to find nearby Pokémon in Pokémon Go, without being limited to the range of the in-game map. This guide will explain how to use the site to find Pokémon near a particular location. In Pokémon Go, the typical strategy for finding Pokémon is to wander around until you are lucky enough to have a Pokémon grace you with its presence. Until now, the only way to make Pokémon hunting easier was through an arguably more arduous process involving command lines and programming knowledge. However, thanks to the new website PokéVision, players can now see Pokémon spawn locations in real time on Pokémon Go in just a few simple steps. PokéVision is a new mapping website that allows players to see all of the Pokémon spawns around a specified location in Pokémon Go. The site displays an interactive aerial map along with a scanning button at the bottom. Type an address into the search bar to specify a location, or click on the map itself to place a marker in the location you wish to scan. With a marker in place, simply press the red button at the bottom of the map to scan for Pokémon around the map marker. In a few moments, the map will reveal all of the available Pokémon around the marker, each with individual countdown timers indicating the time until the Pokémon despawns from that spot. Scanning can only be done once every 30 seconds. PokéVision uses the Niantic API to track the locations of Pokémon in real time, and is thus at the whim of the fragile Pokémon Go servers. PokéVision will still be available, albeit slow functioning, when Pokémon Go is offline or having any sort of server problems. Even when the site is working, you may still experience long scan times during peak hours. PokéVision can be a convenient mapping tool for active Pokémon hunters once Pokémon Go smooths out its server issues. 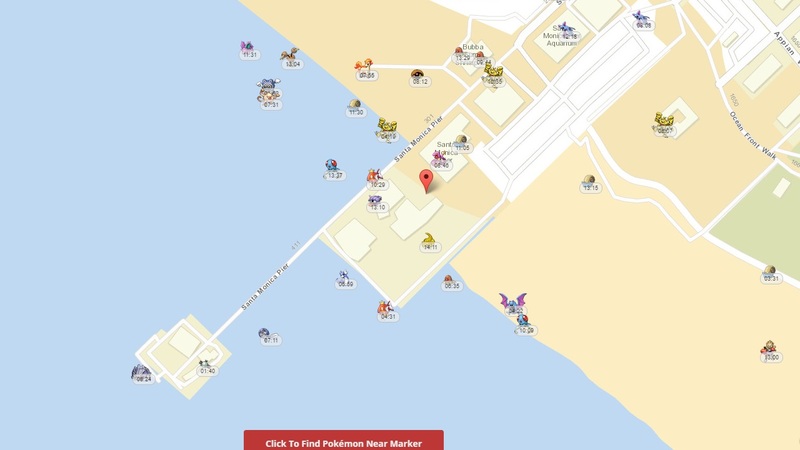 PokéVision defaults to Santa Monica Pier, which seems to always have Pokémon spawn information even when other locations won't scan. It’s also worth noting that PokéVision will only show Pokémon that normally spawn in the wild, not ones that have been influenced by consumable items. Pokémon that spawn as a result of Lure Modules or Incense cannot be tracked by the mapping tool, so you’ll have to search for them the old fashioned way. PokéVision will otherwise work for any location where Pokémon Go is available. If the site doesn’t seem to be working, then the Pokémon Go servers are most likely on the fritz. You can use the Pokémon Go Server Status site to check the current uptime of Pokémon Go. Another site called Is Pokémon Go Down or Not shows server status information over the past two days, as well as latency data.